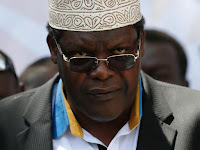 Tuesday February 12, 2019 - Deported lawyer, Miguna Miguna, has once again attacked National Super Alliance (NASA) leader, Raila Odinga, saying that he wants the Presidency in 2022 so that he can continue looting like President Uhuru Kenyatta. In a post on social media on Monday, Miguna said Raila wants the Presidency in 2022 to accomplish his evil plan of looting billions of shillings from poor Kenyan taxpayers. He also linked Uhuru and Raila's new bosom to the same adding that the two are not in any way interested in realizing justice. Miguna urged Kenyans to reject the two leaders who pretend to be helping Kenyans yet they are enriching themselves by stealing like other fallen African dictators. "Reject the primitive idea that Africans deserve the worst, most brutal, and backward tyrants like Mobutu, Bokassa, Jomo, Moi, Amin, Biya, Uhuru Kenyatta or Raila Odinga. These despots and their sycophants aren't interested in justice. They are interested in looting our resources," Miguna wrote. man. smoke the cursed vampire for those who don't him and his chameleon scheme. NOW MIGUNA YOU HAVE HIT THE NAIL RIGHT ON ITS HEAD. HE AND BROTHERS ARE WORSE THAN ALL THAT HAVE EVER BEEN MENTIONED IN KENYA. I HAVE AN EXPERIENCE. CURRENT REGIME KNOW HOW TO RETAIN SEEDS FOR NEXT SEASON, WHETHER THEY ARE CORRUPT OR NOT, THEY ALWAYS RETAIN FOR TOMORROW, UNLIKE OUR LAKE BROTHERS WHO NEVER CARE ABOUT SUPPER DURING LUNCH TIME.